Its name means Tower of Silver, and it is located in Calle Santander. This tower is from the same epoch as the Torre del Oro (Tower of Gold), but it is much more modest respecting to its construction. 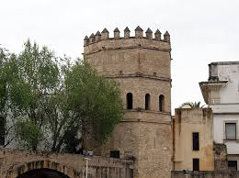 It use to unite the walls of the Alcázar with the Torre del oro. Its construction is octogonal and has suffered many modifications most of all in the Middle Age period.